President David Granger interacting with residents at Rose Hall during a community meeting. 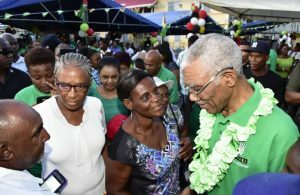 President David Granger has East Berbice-Corentyne voters at next month’s local government elections to put aside political and personal loyalties and vote for the best candidates to manage the affairs of their towns and villages. “What is good for Rose Hall is good for Guyana. So do not put lazy people there, do not put people who come from your party, your cousin or your aunty but put people who are concerned with the economic development of Rose Hall Town,” he said on Friday at a community meeting at Rose Hall. Local Government Elections will be held on November 12, 2018 and will make the first time such elections have been held in succession in over 23 years. In what appeared to be call to break political loyalty by that community to the opposition People’s Progressive Party (PPP), the Guyanese leader urged the residents of that sugar and retail trade dependent town not to vote overwhelmingly for councillors from one political party. “We take Local Government Elections seriously because we know the importance of democracy and if you put six or eight persons from the same party, there will never be discussions; just obedience to party’s headquarters. They would be concerned on the instructions they receive,” said Granger who is leader of the People’s National Congress Reform (PNCR)-dominated A Partnership for National Unity (APNU). Granger advised the Rose Hall residents that Local Government Elections empowers “you to make decisions that are in the best interest of your communities and yourselves.” “Local Government Elections gives you freedom, freedom to sit around the table and make decisions,” he was quoted as saying in a statement issued by the Ministry of the Presidency. The Head of State was at the time addressing residents of the 176-year-old Town who gathered at the Rose Hall Primary School for a community meeting. He said though the Town has a long history of self-management, self-governance and a focus on residents’ development, it has undiscovered and underestimated potential, which can create a better life for residents. As such, President Granger said the time has come for residents of Rose Hall and other communities across the region to elect persons who would help the Town to achieve its full potential. “Rose Hall has vitality. Rose Hall is the only town where the population is improving and if you have a vibrant town, then people are going to flock to it. What makes Rose Hall attractive is the power of the market place, it is the main business district in East Berbice – Corentyne. You have banks, markets, shops and stores, workplaces, sports organisations, schools. So we have to look at the municipality to harness the energies of all these places and institutions so that they could make the town prosperous and the people richer. We do not want a lackadaisical municipality. We want a democratic municipality. We want a municipality that makes Rose Hall an attractive destination for investment and commerce,” said the President. He continued: “We want Rose Hall to be prosperous and it can be the means for revitalising this entire region. The way this town is managed is important not only to the region but the entire country and that is why local government elections are important,” he said. Meanwhile, thirty students of the Rose Hall Primary School and other surrounding schools became the latest beneficiaries of the Government’s Public Education Transport Service (PETS) formerly known as the “Boats, Buses and Bicycles plus Breakfast and Books” (‘Five Bs’) programme. 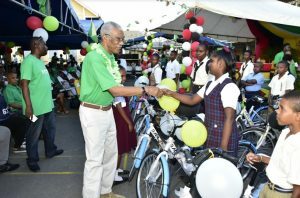 The bicycles were handed over by President Granger in the school’s compound. During the simple handing over ceremony, the President urged residents to elect candidates who have their best interests at heart, particularly in the areas of education and community development. President Granger, who was accompanied by Minister of Social Protection, Ms. Amna Ally, said the development of the country depends on developing an educated nation. To this end, the President called on residents, particularly elected officials, to take responsibility for ensuring that every child is able to attend school and complete their education. The PETS programme, he said, is not a political gimmick but a means of ensuring that children are given an opportunity to attend school. “The bicycles are here only for one purpose and that is to get to school. We are a caring [government]. We understand the needs of citizens- children, housewives, workers. This is not a profit making programme, it is not a political programme, we give bicycles to the children who need them and this is all part of local government. Local government is not about party politics. it is about delivering services to the people. That is what Local Government Elections are about; satisfying peoples’ needs,” President Granger said. In this regard, one students who is recipient of a bicycle said she would usually walk from Port Mourant every day to attend school at the Rose Hall Primary. When presented with the bicycle, the student thanked President Granger and the government for the initiative.